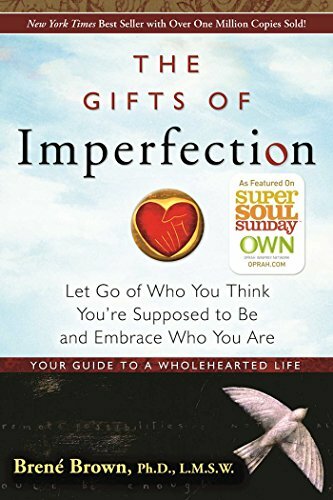 I am reading this book right now called The Gifts of Imperfections, by Brene’ Brown. In the book she has 10 guideposts to life. Her whole approach is not how to but why you make the decisions you make. They were so many nuggets in her book. It has been a long time since I connected with a book in the way I connected with hers. I saw myself in those chapters. I was really surprised. One of the many things she said that stood out to me was when she said there is no fast way to do the work. She couldn’t give people a how to because it was a quick list of steps is not going to help you with long lasting change. A blogger that I follow, Aqua, brought up this same topic in her post. She talked about why blogs with headlines like 10 Ways to Happiness got more likes than Christian blog posts that basically said the same thing. I get it. Putting in the work is hard. I talked about in a previous post as well. I would much rather get a top ten things to do, or avoid instead of doing soul searching work that is difficult and takes a long time to show results. Most people don’t run marathons for a reason. We want Microwave Growth. I know at times I do. Brene’ talks about in her book, how that just doesn’t work, even when we want it to. I will be talking more about her book because it was so life changing to me. I think its great that other people are starting to get this concept as well. The more of us that talk about it, maybe more people will be willing to put in the work to change themselves and not go for the quick fix. I’m an enigma. I can’t be put in a box. I know at some point I may need to make a choice but right now I’m just living the best way I can. I may listen to a Joyce Meyer podcast on the way to work, gospel on my Pandora during work and ride home to Cardi B. I am going on vacation with my girls next weekend. I will be probably go to a few night clubs and have a few adult beverages. Some would say that isn’t appropriate. I disagree. I won’t be scantily clad, grinding on strangers, or overly intoxicated. I like going to parties every now and again. I also think you can relate to other people when you understand the things they like. My bible study group went to see Jumanji and were able to point out the way God moved in the movie. I didn’t notice any of that when I was watching but I don’t think they were reaching. When your mind is always on God you see him in everything. I can identify with people because I have been where they been. Jesus ate with tax collectors, and all kind of non conventional people. I know you we are supposed to be separated from the world but it’s just not something I can do 100%. Not right now anyway. If I can tell a college kid I went to the club on Saturday night and then went to church and Sunday school the next day they will know they can too. I wrote the words above Before I went on vacation. Now that I’m back I’m not sure how I feel. I know I will probably go to the club again and drink alcohol. I think I’m at the end of an era. I was at a women’s retreat this weekend and I asked should Christians go out and most of the women there said yes that it was perfectly ok. They said be cautious because you don’t want to be a stumbling block but the souls you could be saving are more important. I don’t disagree. One woman said she has lost the taste to go out. I think I’m losing my taste for it as well. I don’t know. Part of me feels like it’s a cop out because I’m over 30, I should be partying less. Another part of me doesn’t want to leave my old life behind. The entire basis of spiritual growth is being transformed. I’m more like slowly weaning myself off. I have to ask the question am I still holding on because of other people or is it because of me? I don’t want to shut the door completely, more like cut back some more. Like birthdays and special occasions only. Maybe it’s just this season in my life. It’s about to be summer so party season will soon be upon us. I am going to take it one event at a time. The other ladies felt pretty casual about the entire thing. I didn’t feel convicted, so this isn’t a strong pull but maybe like I didn’t belong there. I don’t know. I will probably go to a few more parties just to be sure I didn’t misunderstand my feelings.